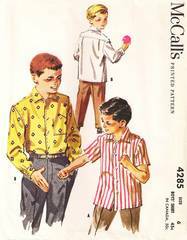 Original vintage sewing pattern from 1957 for boys shirt in long and short sleeve versions. Long sleeves have buttoned cuffs. Optional buttoned, shaped pocket. Boys Size 6, Chest 24, Waist 22. Pattern is complete and has been very neatly cut. The envelope and contents are all in excellent, well preserved condition.